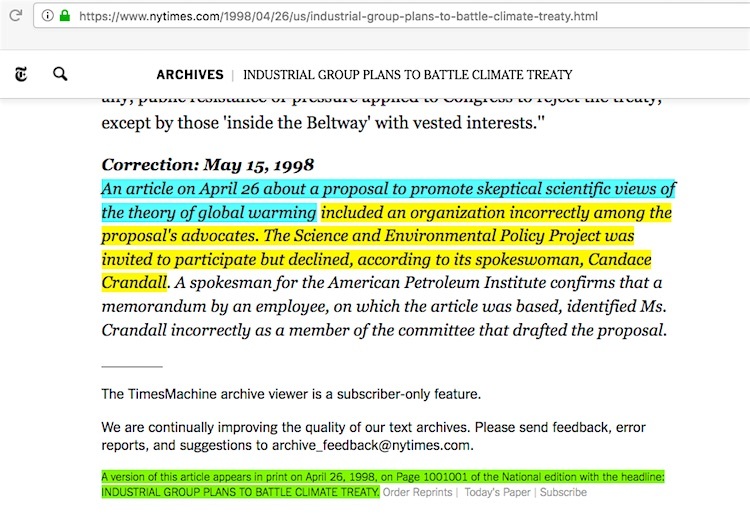 The second most damaging, laughably so when its actual content is taken into consideration in an objective manner, is the 1998 American Petroleum Institute (API) “Victory Will Be Achieved when …” leaked memo. 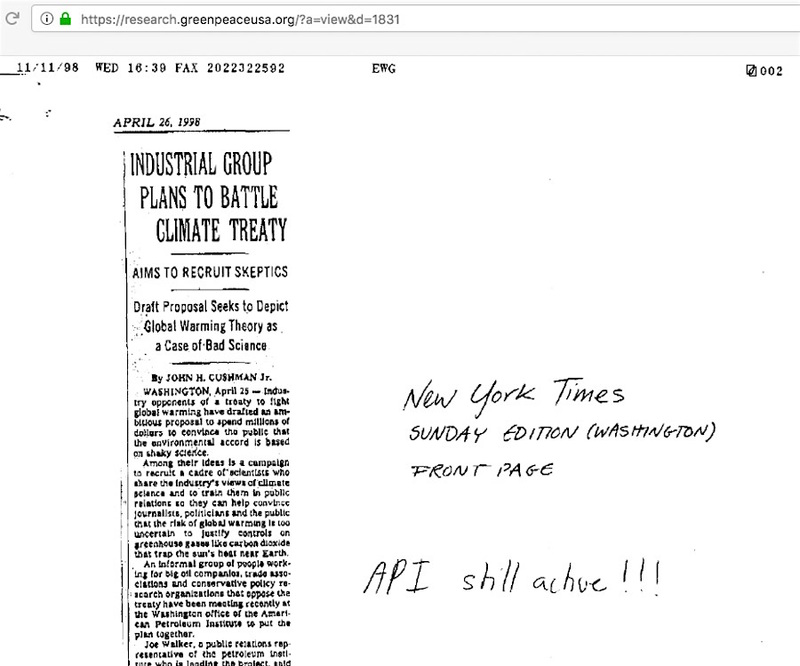 Similar to the non-WFA ‘strategy memo’ getting its first major news splash at the New York Times, the API got its first major national attention via John Cushman’s April 26, 1998 “Industrial Group Plans to Battle Climate Treaty” NYT article. 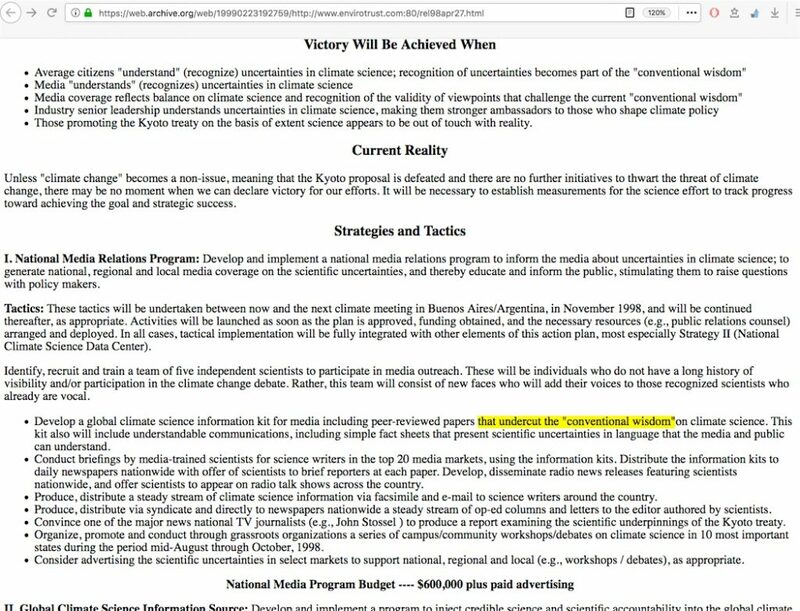 The difference, however, is that Cushman’s article did not actually spell out the now-infamous “Victory will be achieved …” keyword phrase. 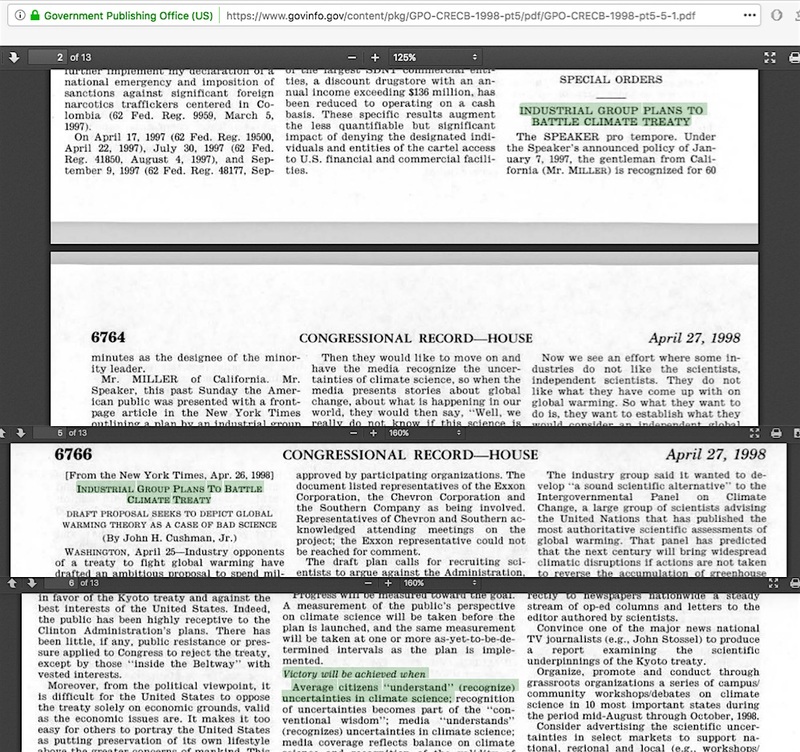 Similar to the WFA 1991 NYT article quoting an official associated with the ICE campaign saying the memos were unsolicited and never used, Cushman noted – twice – how the API memo had no appearance of being a finalized, in-progress, industry-wide directive. 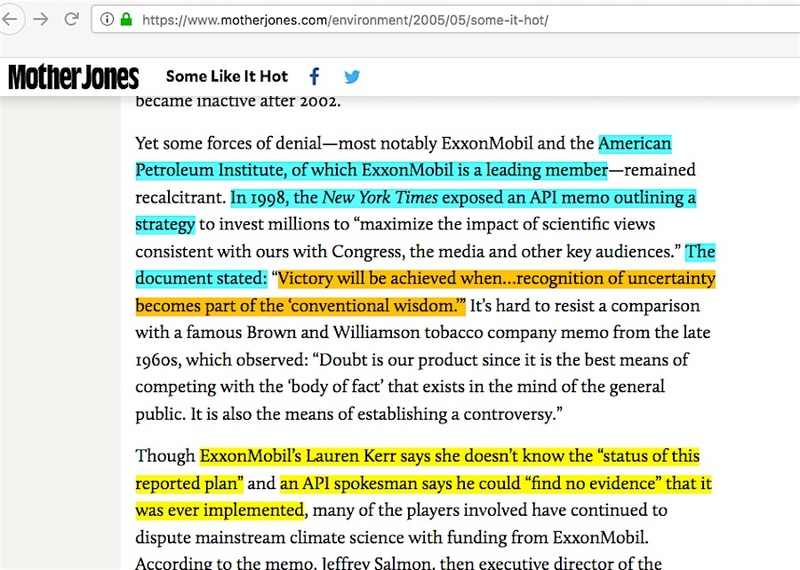 Similar to the way officials of the ICE campaign said elsewhere that the memos were not implemented and/or were unsolicited, the National Public Radio program “Living on Earth” quoted the API Vice President who said he never saw nor asked for the memo, and a years-later Mother Jones magazine article quoted an API spokesperson saying there was no evidence that the memo was ever implemented. 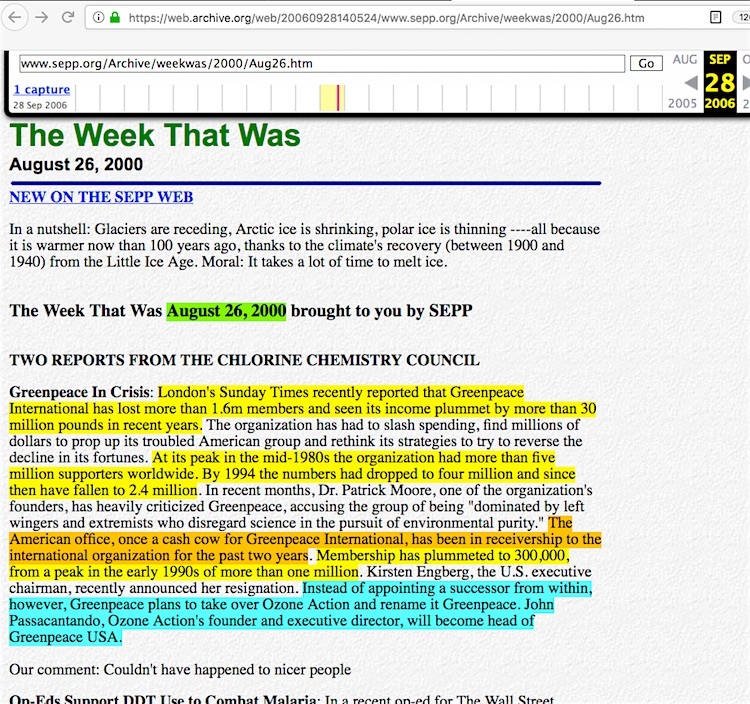 Similar to the way the ICE memos supposedly had skeptic climate scientist Dr S Fred Singer involved in the misinformation efforts (he never was, thus a correction was necessary), Cushman’s article said Dr Singer and his organization was involved in the API memo planning ….. but he and his organization never was, thus a correction was necessary). 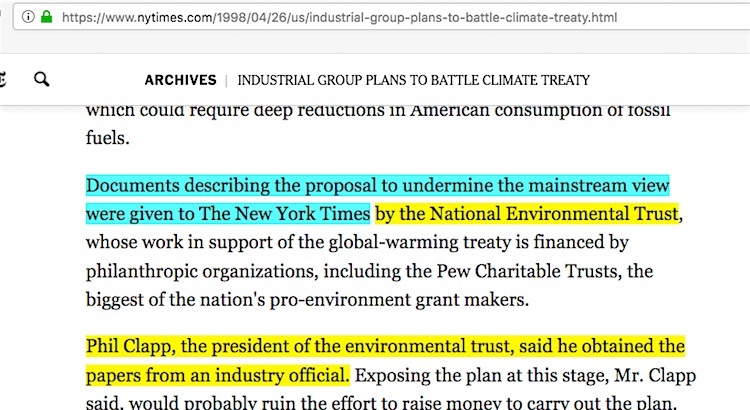 Somewhat similar to the way the1991 NYT article credited the Sierra Club for providing it with the leaked memos which never spoke of the incident again, Cushman credited the National Environmental Trust (NET) for turning over the API memo, and apart from the NET putting out a large online/fax blitz about their possession of the memo on the same weekend as the publication of Cushman’s NYT article (so large that California Rep Charles Miller felt compelled to enter it and the Cushman article into the 4/27/98 U.S. Congressional Record), the NET apparently went silent on the matter not long afterward. 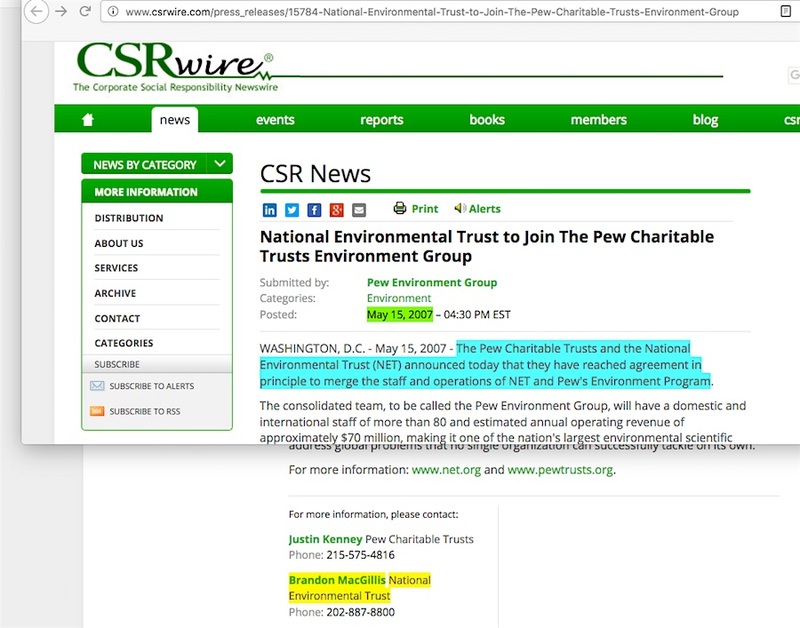 There’s no current NET website; its founding organization, the Pew Charitable Trusts merged it into Pew’s Environmental Group by late 2007. 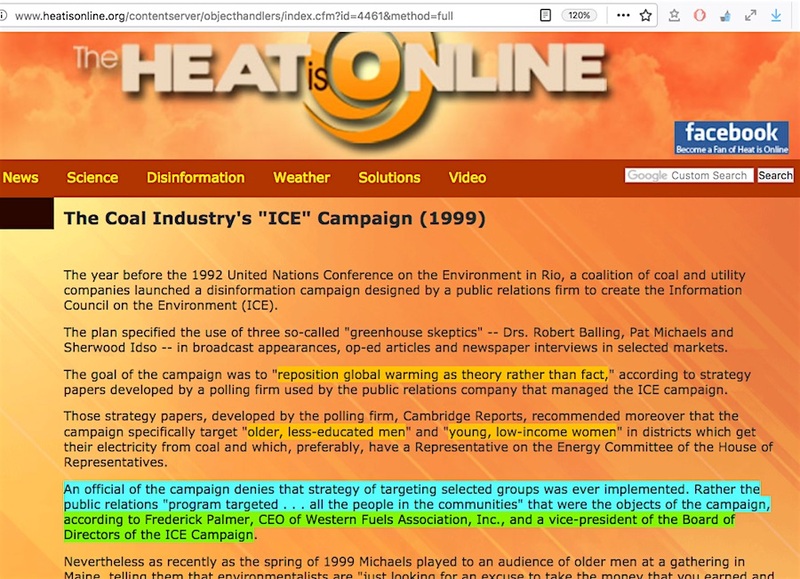 Rummage through archive pages for the NET, and you see its “Global Warming campaign” page links to its exposé of the API memo up to October 1999, but in early 2000, it was gone from NET’s revamped home site, and was nowhere to be seen in NET’s new “HotEarth.net” website, or its subsequent newer 2004-5era “net.org global warming” pages website or its “Newsroom” pages — featuring ex-Ozone Action workers Brandon MacGillis and Kymberly Escobar. 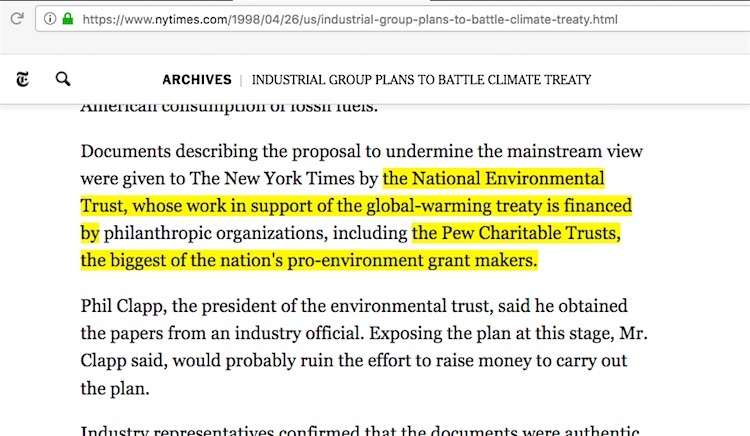 Good luck trying to find any mention of the API memo among the pages of the Pew Charitable Trusts in 2008 and onward, particularly in its “Global Warming” pages. Pew never mentions the memo anywhere that I can readily find, but I will gladly correct the record on that in this space with an author’s addition. 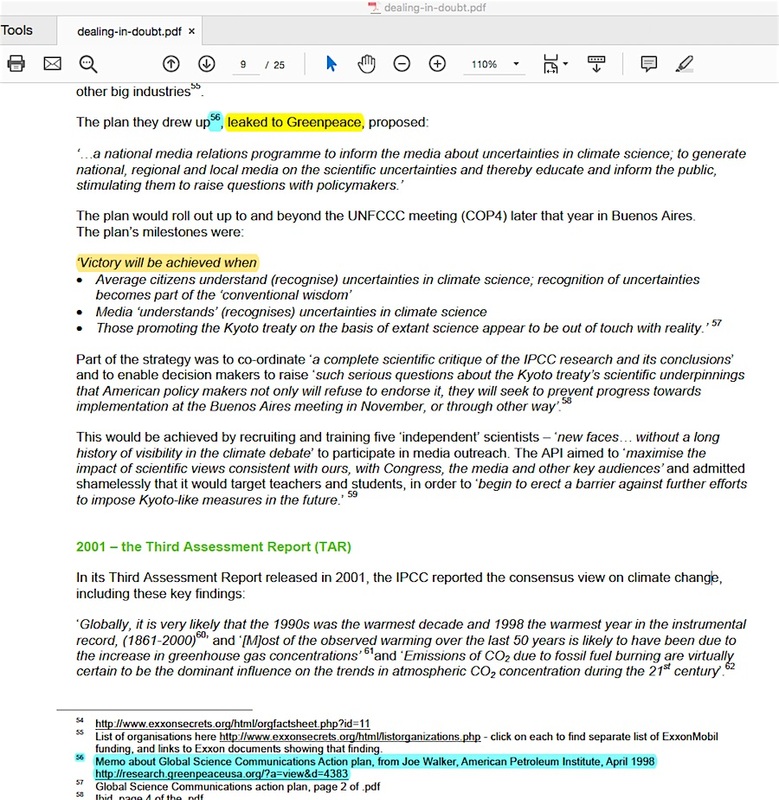 Why did the Sierra Club never again focus on the alleged problem of corporate-paid ‘shill scientists’ spreading misinformation via the “smoking gun” ICE memos they had? Perhaps that simply wasn’t even close to their central interest. 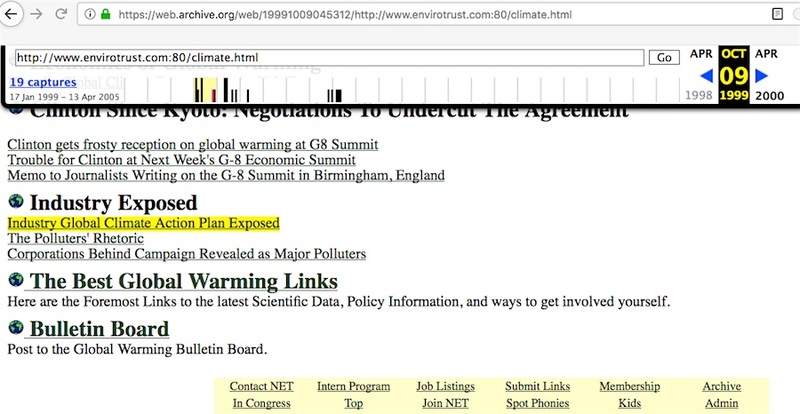 Why did the NET seemingly abdicate pursuing the situation surrounding the API memo? Perhaps for the same reason. 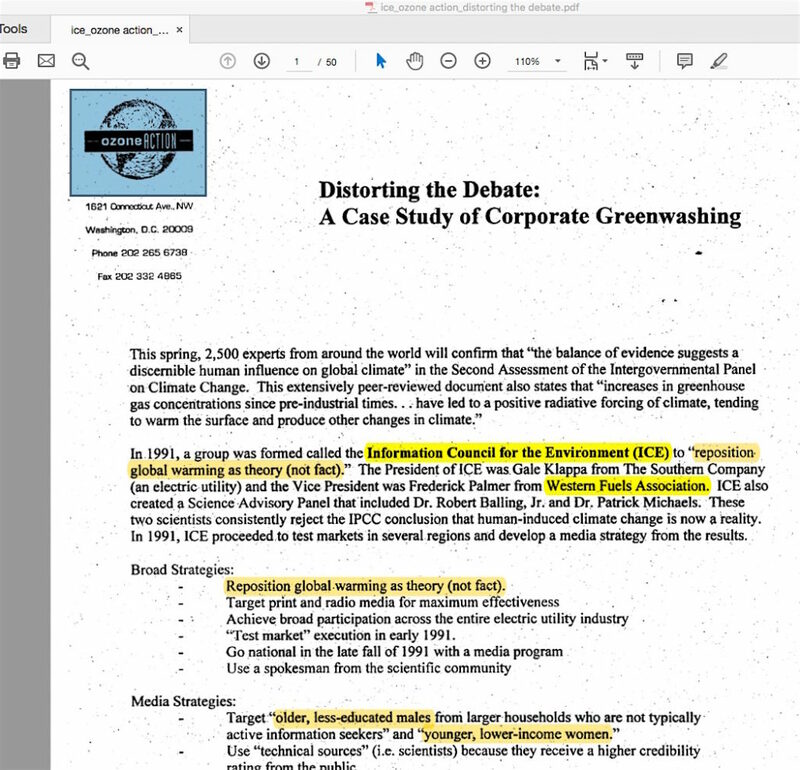 Similar to the way “Greenpeace USA née Ozone Action” took over for the Sierra Club on pushing the ICE memos as evidence to indict skeptic climate scientists and their allegedly connected fossil fuel industry cohorts, Greenpeace basically owns the focus on the API memo, saying as far back as 2010 that the API memo was leaked to them. 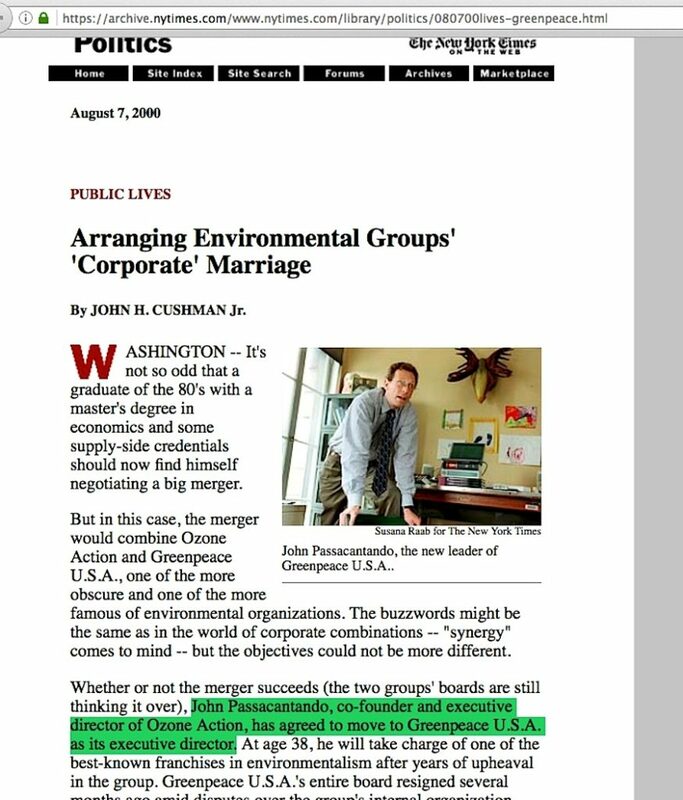 Why do I term the group “Greenpeace USA née Ozone Action?” Somewhat similar to the way Cushman tied the NET into the Pew Charitable Trusts in his article about the API memo, Cushman also told the story of how the Ozone Action group merged into the USA arm of Greenpeace. 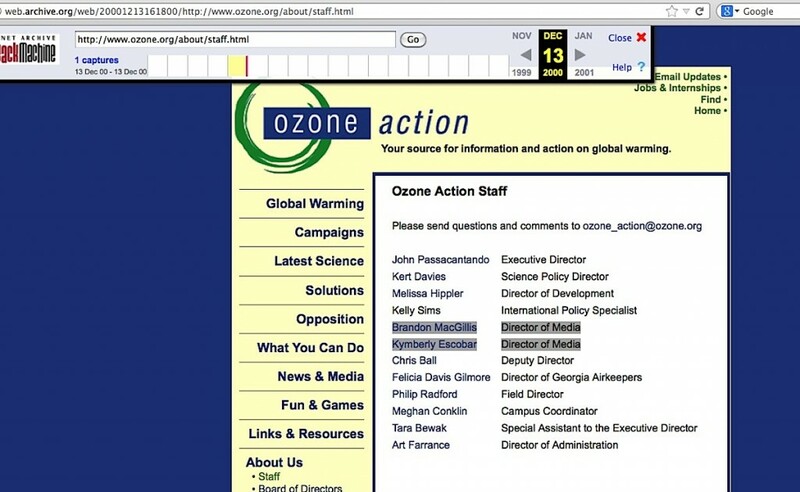 With several of its top people also making the 2000 merger transition – John Passacantando, Kert Davies, Kymberly Escobar, and a few years later, Phil Radford, Greenpeace USA’s top end was basically Ozone Action under a new name. 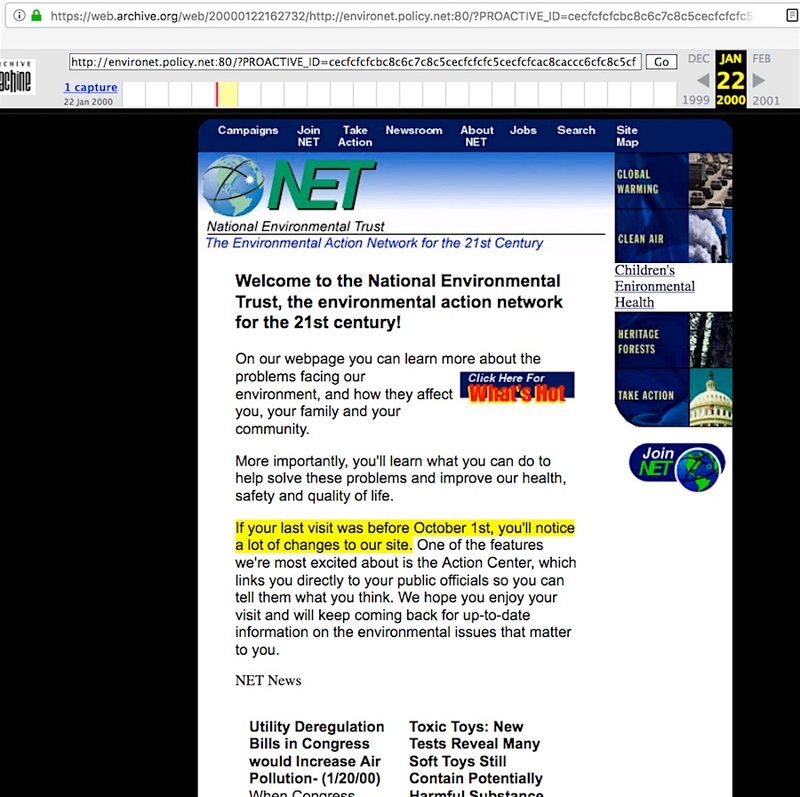 Who had departed Ozone Action before the merger to work at Greenpeace at the time of the 1998 NYT / NET API memo situation? 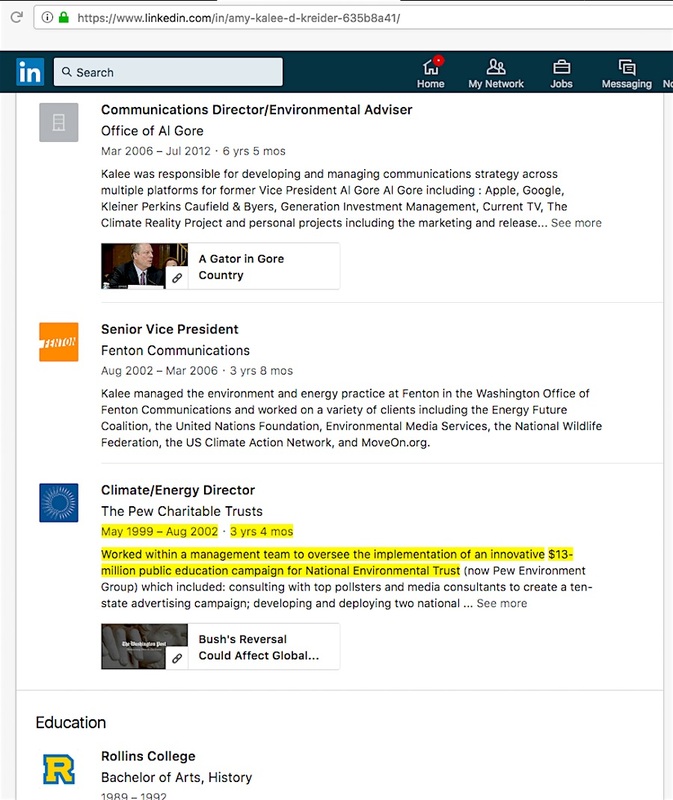 Self-described Ozone Action co-founder / future Al Gore spokesperson Kalee Kreider, who moved from Greenpeace to the NET right afterward. 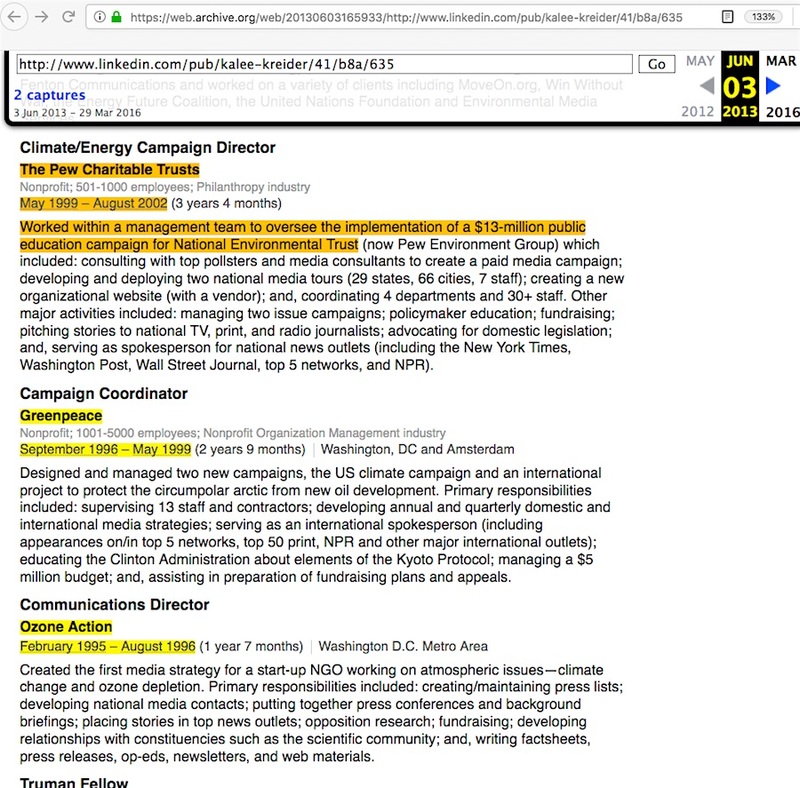 Not that she chooses to share any of that particular pre-NET work history at her current-as-of-today’s-post-date LinkedIn resumé. 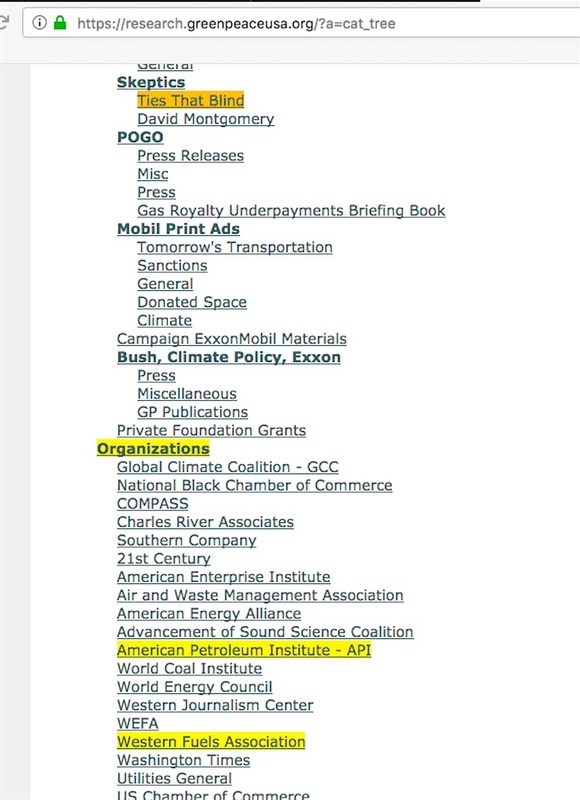 Why would the “save the whales” Greenpeace organization take over? 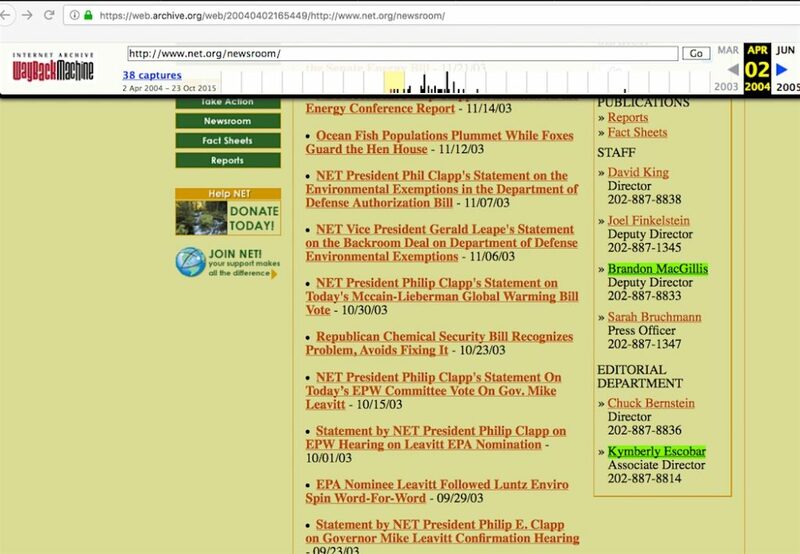 Because in 2000, the old Greenpeace, with its then-recent lack of focus and declining financial support, was not the new Greenpeace USA. That wasn’t merely the opinion of a victim of “Greenpeace USA née Ozone Action,” the situation was touted by a far-left group as well. Small world. 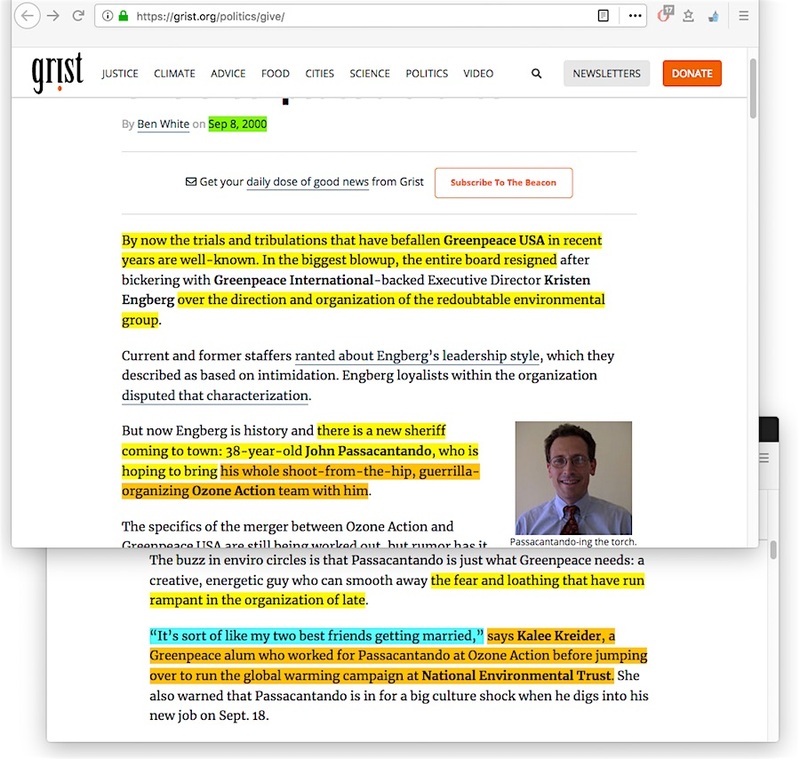 But what reason would Grist have for portraying Passacantando as a gun fightin’ sheriff? 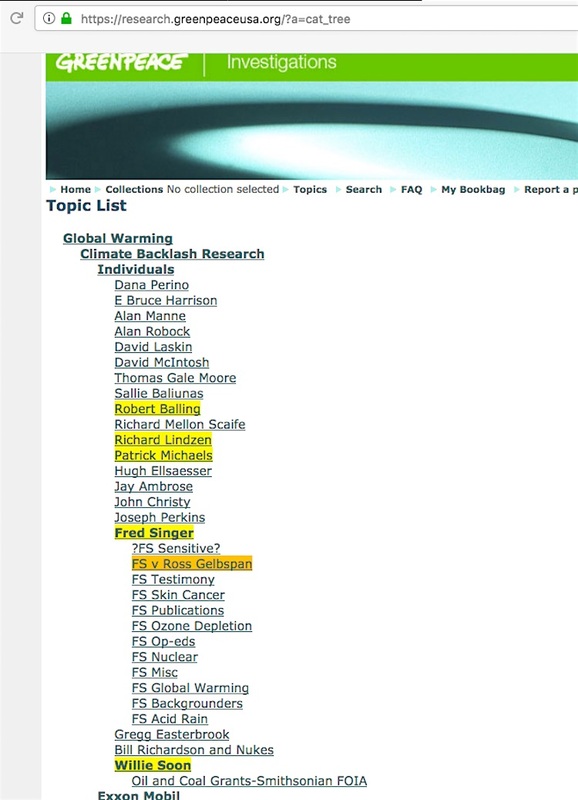 While there is some really small world collaborative efforts collected in “Greenpeace USA née Ozone Action” document scans, look no farther for the answer than their collections on Dr Singer and myriad other scientist victims / industry enemies in their “industry shills” files. 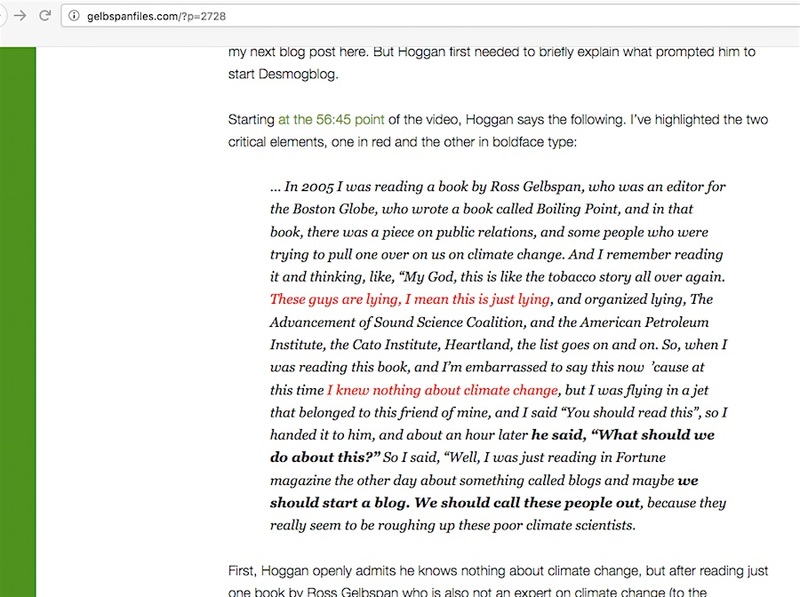 As I described in my October 22, 2015 blog post, when I dumped the words “reposition global warming” into the Greenpeace Archive’s search window, that was the first time after seven months of internet searching when I had been able to read the memos which had long been attributed to the ICE campaign, while their full context had otherwise been buried from public view. Why is the API “Victory Will be Achieved …” memo worthless? 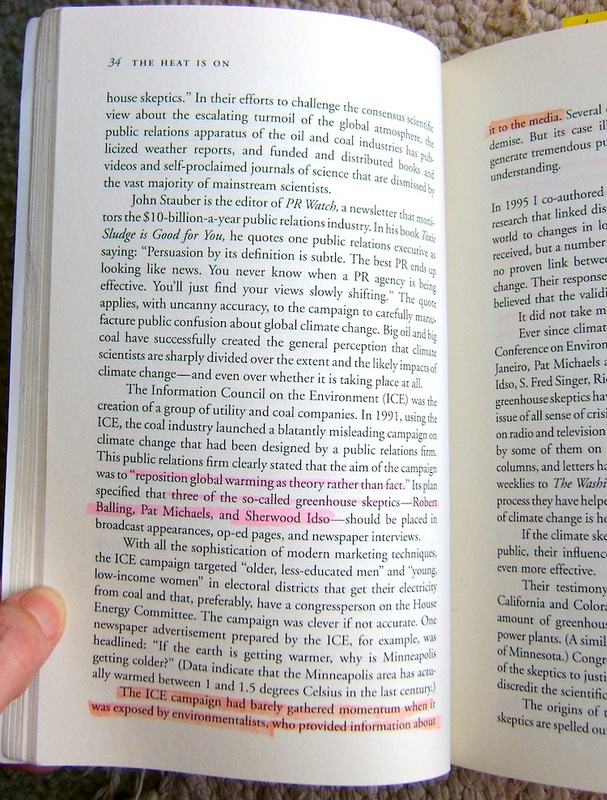 To fully understand this situation, it helps to look at this through the eyes of someone who — rightly or wrongly — perceives that only a lopsided argument on an issue is being presented to the public, and the public would become better equipped to make an informed decision about the issue if a plausible and fact-based alternative is made widely available. We report, they decide, in other words. 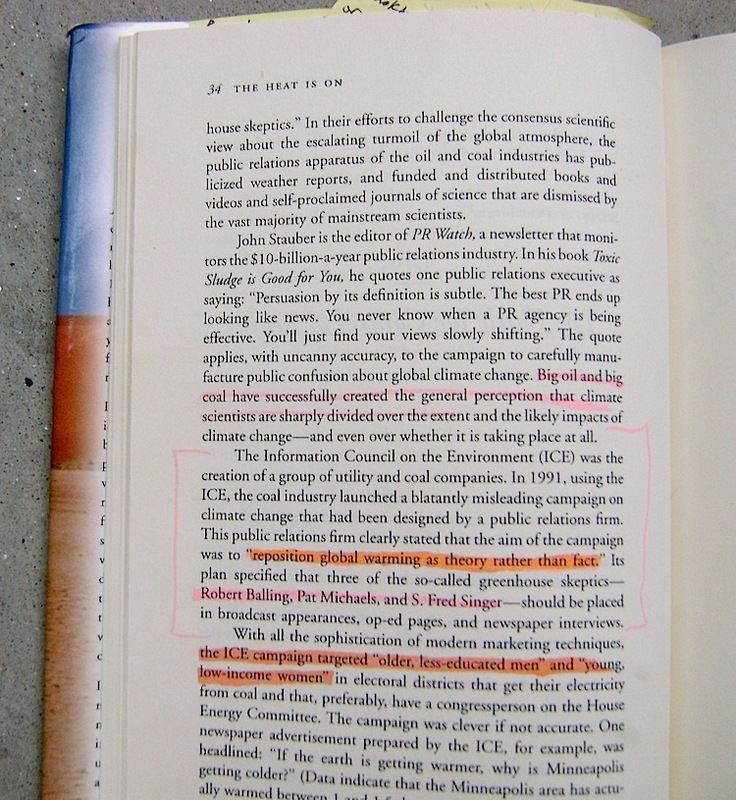 Similar to the mindset of the people behind the actual Western Fuels Association ICE campaign (remember, the “reposition global warming / older, less educated males” strategy/targeting ‘memos’ were never part of that PR campaign), the people behind the API memo clearly perceived how the same lopsided IPCC / Al Gore global warming ‘science’ side was overwhelming the public media, and they mapped out how they could tell if their presentation of a fuller picture resulted in a more informed public and news media. No need to trust me on that latter point. 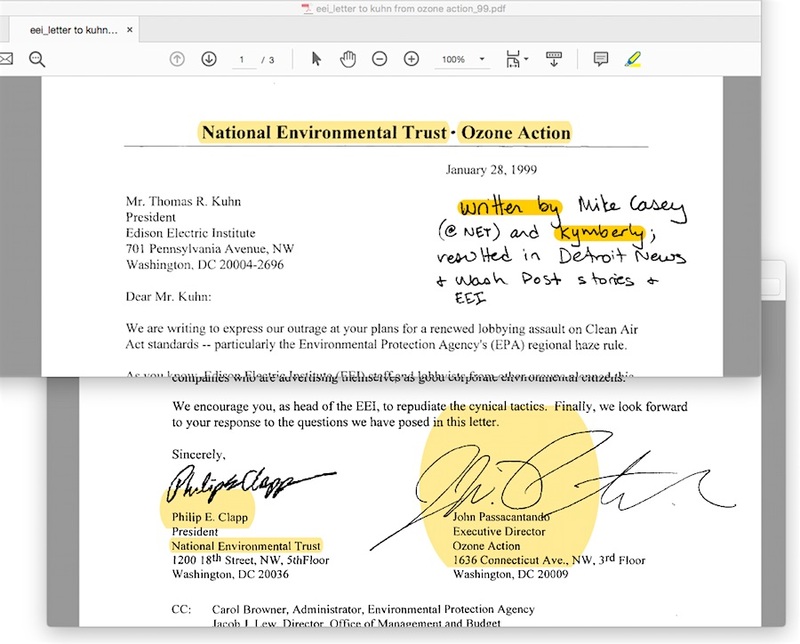 Unlike the alleged ICE memo collection which remained hidden from public view until I began writing about it, the API memo was available in easy-to-read text provided online by the National Environmental Trust the same day John Cushman’s NYT article about it was published. Read the full text here, beginning about halfway down NET’s page. Arguably, the memo could have more appropriately used the words “question” rather than “undercut” in one sentence. What’s otherwise blatantly missing from the memo? 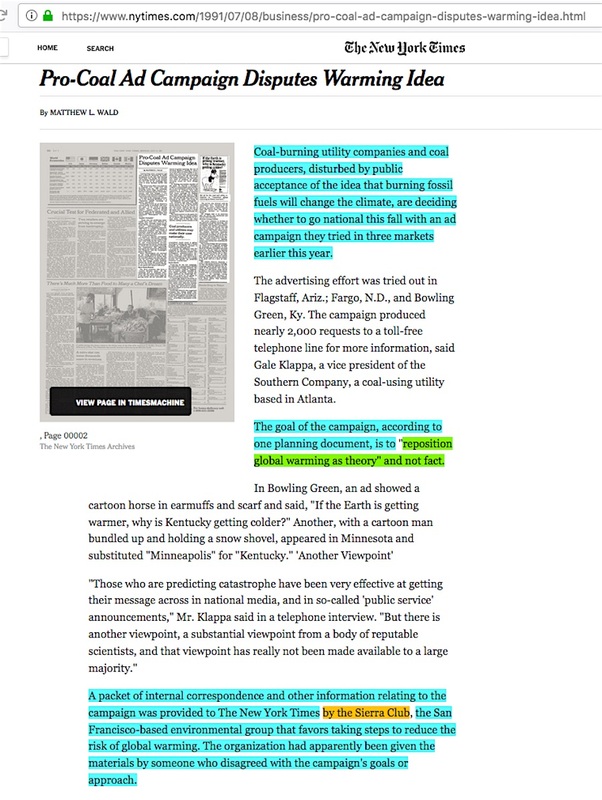 Any indications that the participants perceive their position is an outright lie and that liars-for-hire have the sole objective of spreading lies. To yell “corruption!”, you must first show where it happened. 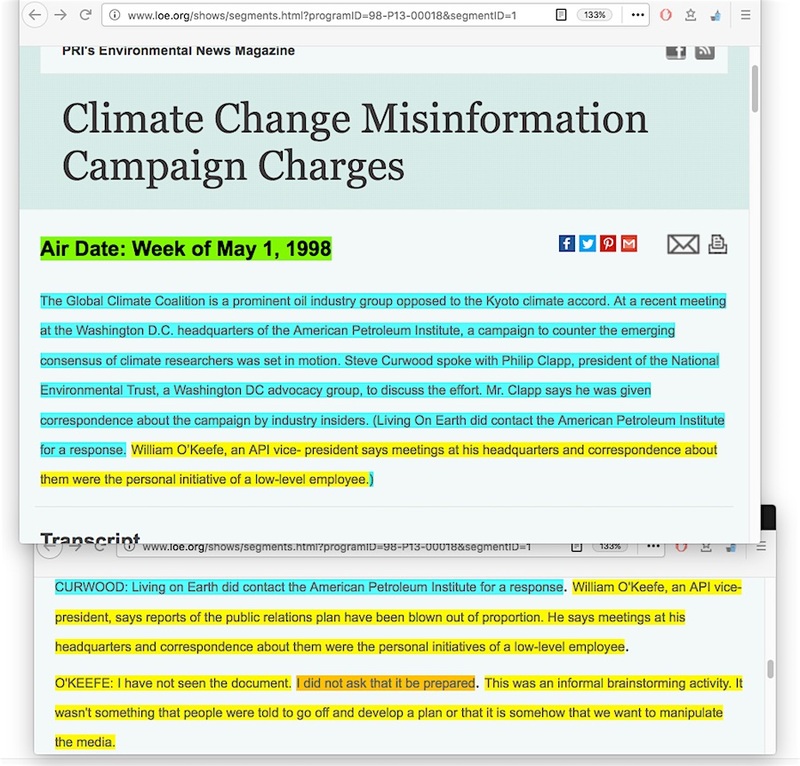 It is nowhere to be seen in the memo, and the people at the NET, Greenpeace, and Ozone Action and elsewhere do not have the climate science expertise to say the skeptic climate scientists are lying. And if the memo is supposed to be evidence of sinister efforts, where is the sinister intent within it, or accusations that the other side is corrupt? 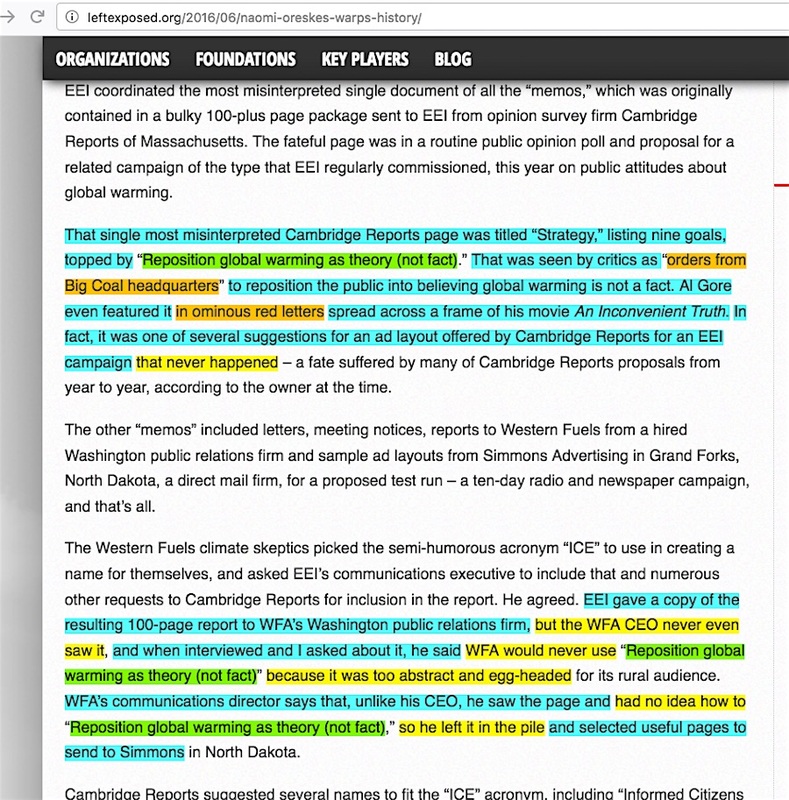 See the solution for prompting the public to dismiss those skeptics out-of-hand? 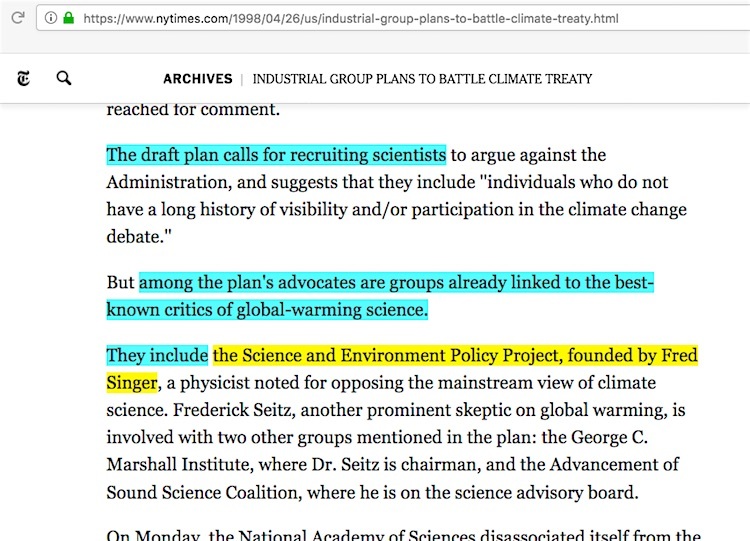 Call the skeptics industry-paid shills and trumpet how this is proven by leaked memos declaring “Victory will be achieved when we reposition global warming as theory rather than fact.” Victory will ultimately be achieved when the larger public intuitively accepts the ‘industry-paid shills’ accusation without question, and when nobody in the field of journalism questions any part of the ‘evidence’ for it or people surrounding it. 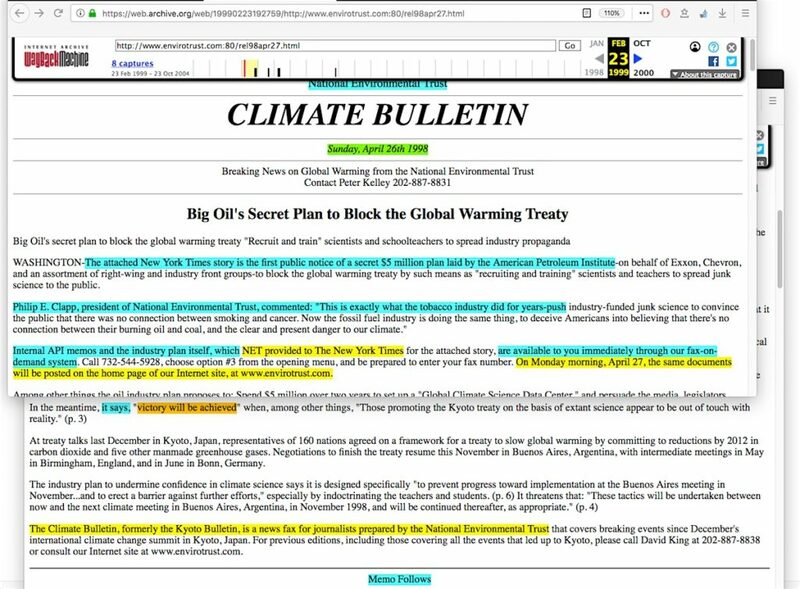 At the end of my January 8, 2019 blog post, I offered a facetious example of what the enviro-activists’ ‘secret memo’ might look like, complete with sinister intent. Problem is, as reported by the Free Beacon in April 2016, there already is a memo partly resembling that. 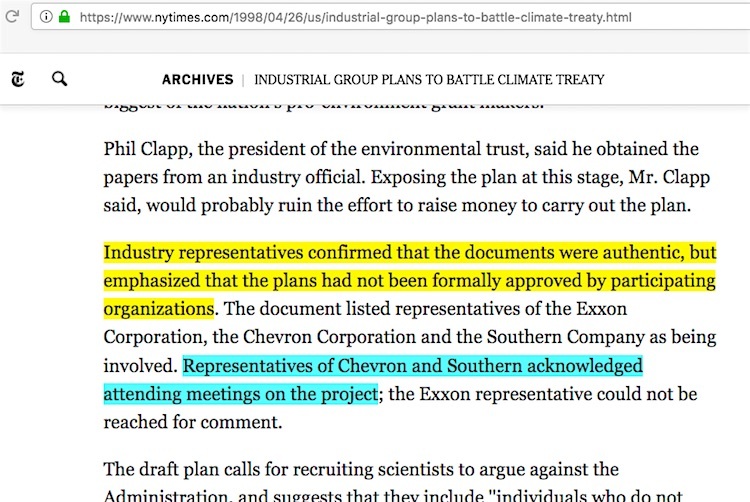 Not mentioned directly by the Free Beacon, it involves one of the lawyers pushing a series of recent ‘Exxon pays skeptics to spread misinformation’ lawsuits ….. and two ex-“Greenpeace USA née Ozone Action” people, who wanted to …. Corrupt … based on what evidence? 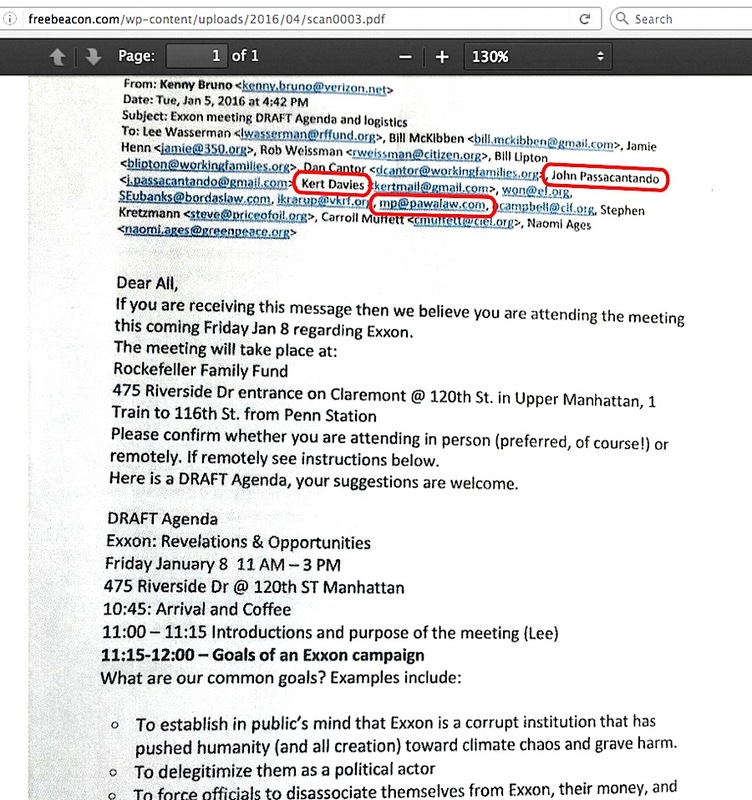 Read the rest of that anti-Exxon memo here. 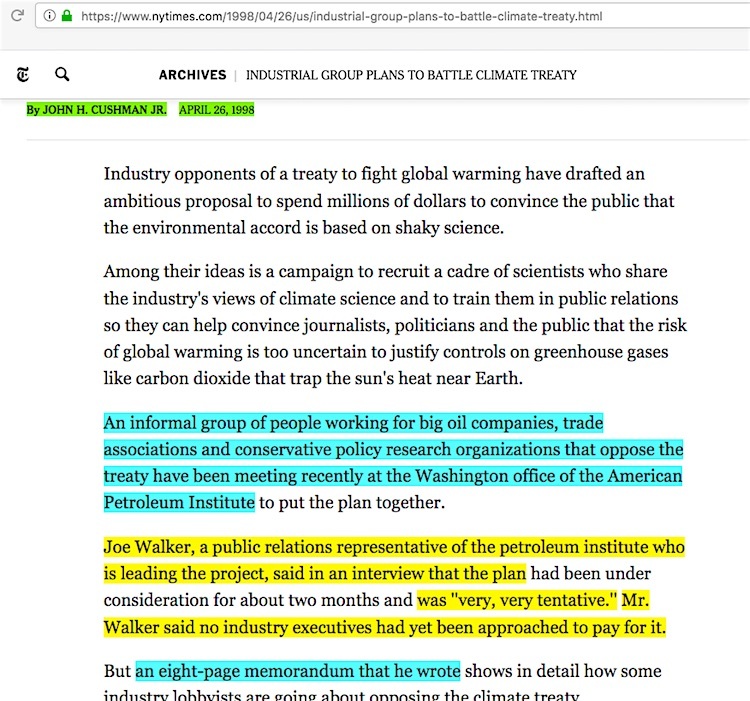 Do we see a sincere effort to inform the public about both sides of the science in order to decide for themselves which side sounds more plausible? Or do we see the appearance of a one-sided, self-serving mentality from a Green Industry clique? 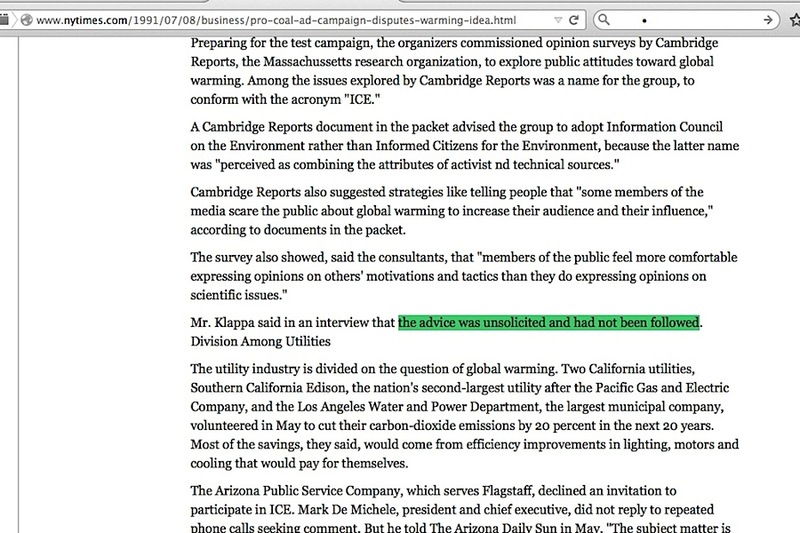 But the real question is, are the people who constitute the central clique behind the efforts to portray skeptic climate scientists as industry-paid shills truly sincere about their viewpoints, or do they know their core two bits of ‘leaked memo evidence’ has been worthless this entire time? That’s the difference between achieving a victory via the dissemination of science material in full context, compared to achieving victory through widespread belief in unsupportable character assassination accusations? Arguably, sixth in a four part series. 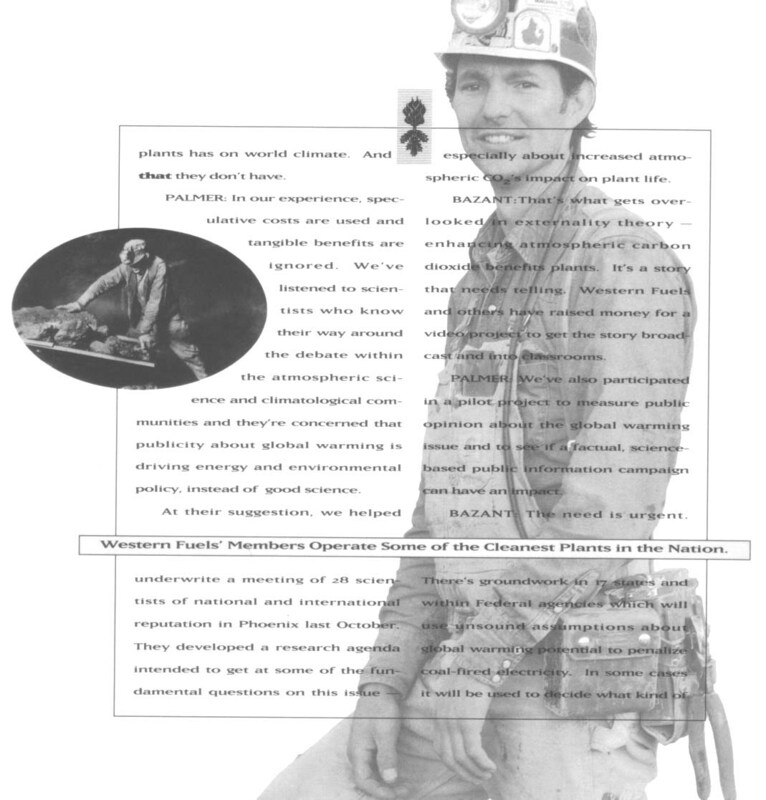 This entry was posted in American Petroleum Institute, Background, Ozone Action and tagged Brandon MacGillis, John Passacantando, Kalee Kreider, Kert Davies, Kymberly Escobar, S. Fred Singer by Russell Cook. 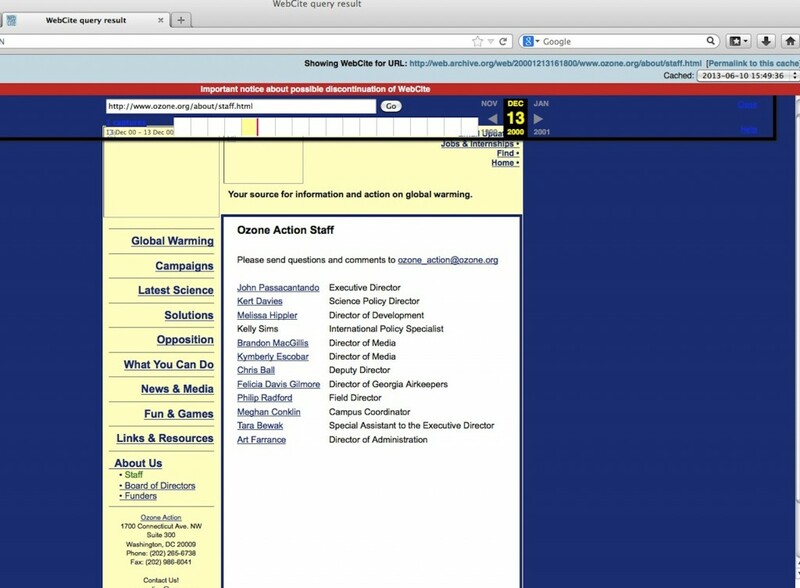 Bookmark the permalink.